Lots of great stuff in this last segment of my interview with Gas Powered Games' Chris Taylor. Here we start getting into some stuff that really disappointed Chris, as he struggled to achieve quality despite pressure from publishers. He also talks about how important it is not to bite off more than you can chew (Space Siege), and why he thinks consoles are the future of RTS. He's very candid throughout, and you definitely don't want to miss the ending when he talks about striking the right balance between pleasing gamers (with modding tools) and publishers (with profitability). Note: I encourage you to watch the downloadable version this time. YouTube is screwing me with their algorithms again, this time providing advertising for Square Enix at my expense. I'll post it here nonetheless. Last time I ever use clips from one of their stupid game trailers. This is the second part of my interview with the IZZE-fueled Chris Taylor, this time talking about his two greatest achievements: Dungeon Siege and Total Annihilation. 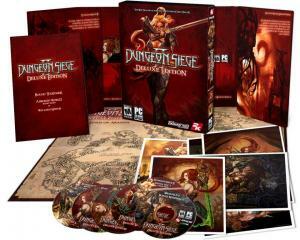 I love both of these games, even though Chris seems to find some flaws (especially with Dungeon Siege). At any rate, it's great viewing. Chris also disagrees with me about game lengths; he thinks games should a lot shorter (a position I've lately come to accept myself). I'm back this week with a chat with Chris Taylor, the Gas Powered Guru behind Total Annihilation, Dungeon Siege, and Supreme Commander. Chris is a witty and very passionate guy, so prepare to be dazzled. In this part, he talks mostly about how he got his start in the games industry, which includes mastering z80 on his TRS-80. Watch above or download the mp4.